Representatives from the Texas Commission on Environmental Quality in Austin visited Port Houston to discuss efforts to further reduce seaport and rail yard emissions Oct. 24. 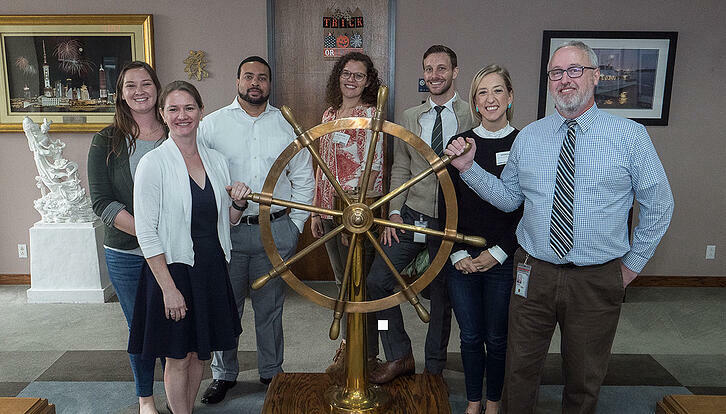 Port Houston staff shared updates on the port’s air quality programs such as the goods movement emission inventory, the clean air strategy plan and the truck drayage loan program. The Greater Houston Port Bureau also attended, as the trade organization represents a large number of private and public companies along the Houston Ship Channel. TCEQ officials noted that Houston is a major focus when the organization considers environmental initiatives due to the city’s large population and many petrochemical businesses among other factors. Port Houston is the local sponsor for the federal Houston Ship Channel and is responsible for maintaining the waterway through dredging projects. Trucking companies and cargo-handling equipment dealerships as well as fleet owners later joined the discussion to learn firsthand about the Commission’s emissions reduction plans and opportunities, including program applications and requirements. TCEQ officials also received a tour of the Bayport Container Terminal and a Port of Houston fireboat tour along the waterway to view current port dredging activities.